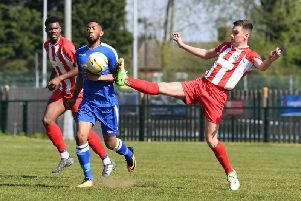 Leighton Town are still seeking their first win under new boss Stuart Murray as they lost 2-1 at home to Royston Town on Saturday. Now in the Evo Stik Division 1 Central relegation zone, the visit of third placed Royston looked a tough game on paper but Town looked more than a match for them, though quality shone through as Town’s home form evaded them once again. Town started the game quickly as they usually do and had the first half chance of the game within the first minutes of the game. A corner was swung in from Jack Copson but it was headed out for another corner by Dan Braithwaite. Copson took the corner again and it was only cleared as far as Alex O’Brien and his shot from the edge of the D was only just over the top of the crossbar. Town were pressuring Royston into making mistakes and losing possession. Leighton were piling on the pressure, but they couldn’t take advantage as James Hatch’s shot was only just deflected wide. This seemed to wake Royston up who started to have chances of their own. Brad Kirkwood was having a great game in goal for Leighton as Erkan Okay floated a nice ball into Rhys Hoeness whose resulting shot was clawed wide. The visitors eventually got the breakthrough when skipper Scott Bridge fired in a low free kick to give Royston the lead. By half-time Royston had had the better of the chances but Leighton had positives to take from the half. But it took just seven second half minutes for Leighton to restore parity, courtesy of a moment of magic from Ben Gallant. The ball came in to him in the 18 yard area and he lobbed the keeper from about 15 yards out who just watched the ball sail over him. The goal definitely galvanised Town who were now breaking with pace. They were keeping the ball in the Royston half who seemed to crumble under pressure. Dave Brown nearly put Town 2-1 up after a through ball was played into him Ronnie Yates could only palm the shot as far as Gallant who should’ve done better at the second time of asking but his shot was straight into the arms of Yates. At the other end Royston skipper Bridge could’ve put them 2-1 up but Kirkwood pulled off a great double save and then claimed the resulting corner. But the decisive goal came two minutes before the end. A Royston corner came in and Braithwaite shot straight at the keeper but Liam McDevitt was there to score a header in an empty net from two yards out. The goal came against the run of play handed Royston all three points - a result somewhat cruel on the home side who’d fought valiantly for what they felt was a deserved point come the full time whistle. Next up for Town is a trip to AFC Rushden tonight (Tuesday).